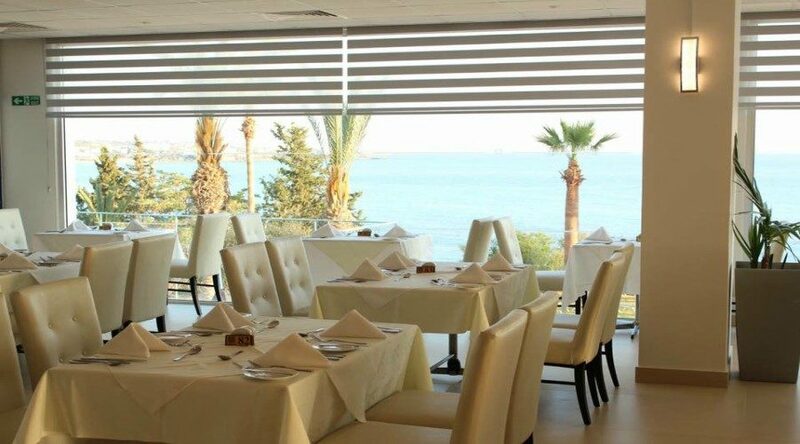 Ascos Coral Beach Hotel sits proudly on a rocky and shingle private beach overlooking Coral Bay in Paphos. 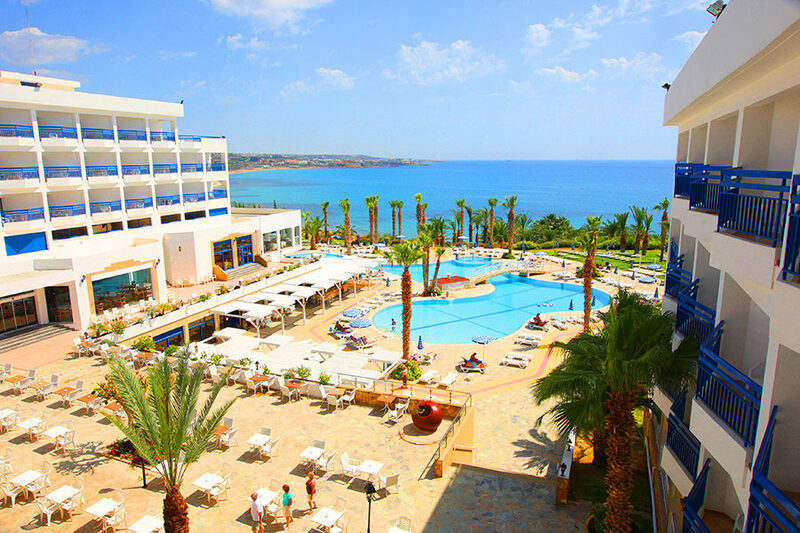 This recently-renovated Cyprus all inclusive hotel is the perfect place for Mum and Dad to relax while there is plenty to entertain tots to teens on site. Whatever you want from your holiday, you'll find it here at Ascos Coral Beach Hotel. Sun worshippers can soak up the rays by the pool or on the private beach. Activity fans have access to everything from water sports and tennis to a well-equipped gym and video games area. 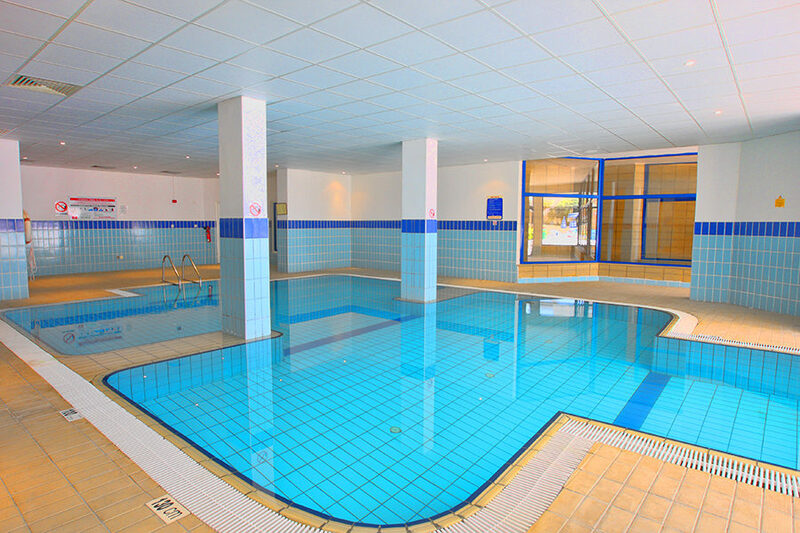 Younger guests can have fun with friends at the playground, indoor play zone, and paddling pool. The guest rooms are stylish and fitted out with all the welcome touches to make you feel at home. Hook up with family and friends using the Wi-Fi access, keep up-to-date with the news on the flat-screen television, or wash away the cares of the day with a bubble bath. The air-conditioning and comfy beds set the scene for a restful night's sleep. Tempt your taste buds with a whole world of flavours at the on-site bars and eateries. Dine buffet-style on international and local specialities at the two restaurants and savour light bites and ice-cold drinks just steps from your sun bed. Choose your favourite tipple to enjoy as you get involved with the impressive line-up of evening entertainment after dark. 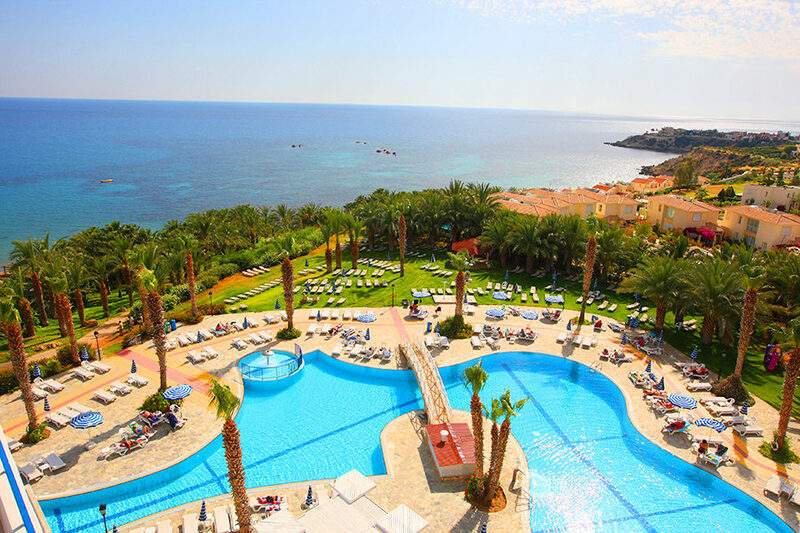 Discover why Ascos Coral Beach Hotel is a popular place to stay for Cyprus holidays. Ascos Coral Beach Hotel offers plentiful facilities, including: an outdoor swimming pool, children's paddling pool, indoor pool, two themed buffet restaurants, two bars, sauna, steam room, Jacuzzi, gym, tennis court, video games area, children's playground and indoor play area, TV room, daytime animation programme, souvenir shop, hair and beauty salon, complimentary parking, doctor on request, minimarket, Wi-Fi access, and room service. 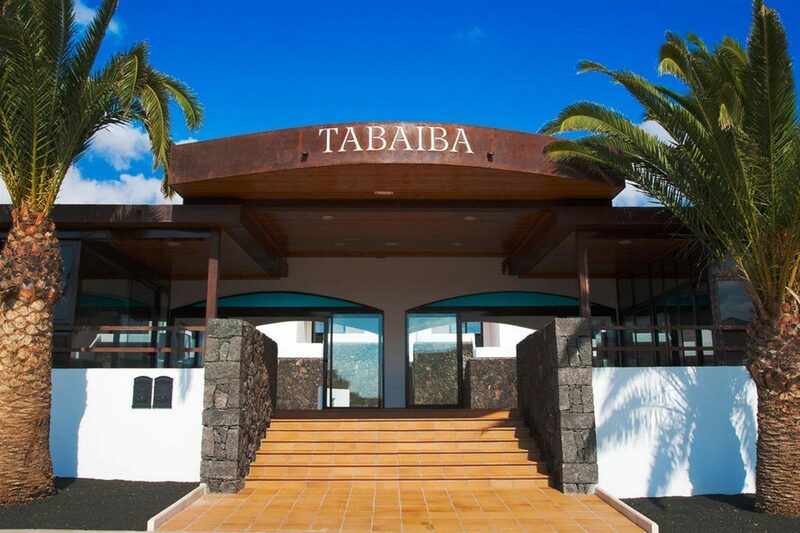 The 24-hour reception offers late check-out service, airline bookings/reconfirmations, laundry/dry cleaning service, car hire, taxi services, and currency exchange. Water sports available nearby at an extra cost include canoeing, pedalos, scuba diving, snorkelling, and windsurfing. 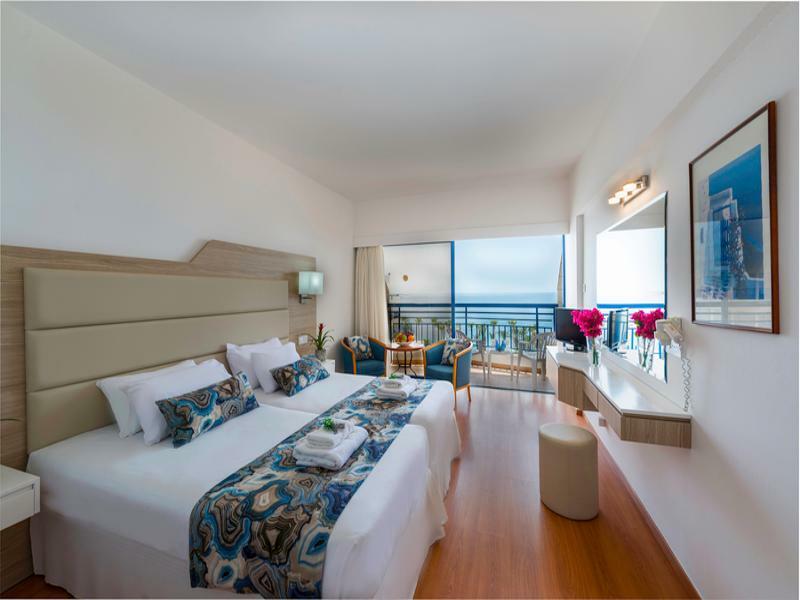 This Paphos hotel has a total of 203 modern guest rooms; comprising Twin and Family Rooms, Twin Rooms for Sole Use, Twin Rooms with Sea View, and Twin Rooms with Side Sea View. Twin Rooms offer a flat-screen television, Wi-Fi access, safety deposit box, balcony or terrace, hairdryer, coffee-making facilities, kettle, fridge, minibar, bathroom with bathtub/shower combo, air-conditioning, and daily room cleaning and towel change. The poolside Apollon Cafeteria offers up a wide choice of buffet-style dishes, show cooking, and snacks. Athena Restaurant opens in the evening for a buffet-style dinner with show cooking. Aphrodite Pool Bar is your go-to for drinks and light bites by the water's edge. Artemis Bar serves a wide choice of hot and cold drinks accompanied by live sports on screen. The evening entertainment programme includes shows, karaoke, mini-disco, bingo, and quizzes.